One main problem with continuing to use nail polish is that labeling doesn’t necessarily reflect the contents of the polish. A study has found that even toxin-free nail polish may have high levels of these toxic chemicals (8). “The labeling does not always reflect the ingredients,” says scientist Valetti Lang, acting manager of the Pollution Prevention Branch of the Department of Toxic Substances Control for the California Environmental Protection Agency (9). “The bottom-line finding is we can’t trust the labels on some of these nail salon products that are claiming to be free of these toxic chemicals,” says Rebecca Sutton, PhD, senior scientist at the Environmental Working Group who reviewed the report. “These chemicals have well-established health concerns…this is not a minor concern for consumers,” she says (10). 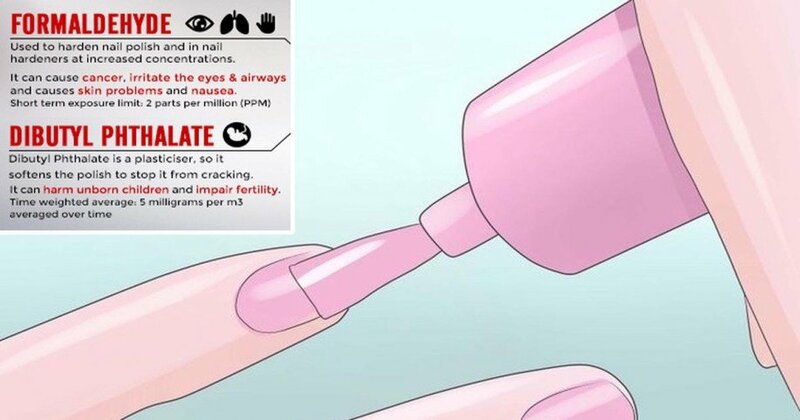 Needless to say, there are countless reasons why you should avoid nail polish at all cost, especially in nail salons, which contain high levels of toxic fumes. Instead, skip the polish and buff your nails for a natural shine.